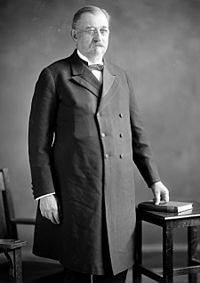 Today in Masonic History Marcus Hensey Holcomb is born in 1844. Marcus Hensey Holcomb was an American politician. Holcomb was born on November 28th, 1844 in New Hartford, Connecticut. He attended local public schools before going on to attedn Wesleyan Seminary School in Massachusetts. While reading law with a local law firm, Holcomb taught school. He was admitted to the bar in 1871. Among his non-political jobs he was the President of the Southington Savings Bank for thirty years. He was a director of the Southington Bank and Trust Company, the National Fire Insurance Company, the Peck, Stow & Wilcox company, the Aetna Nut Company and the Southington Hardware Company. In 1873 until 1910 Holcomb sat as a Judge on Southington's probate court. It was during this time that Holcomb switched his party affiliation from a Democrat. to a Republican. It was also during this time that he was Hartford's city Treasurer, was a member of the Connecticut State Senate, was a deegate to the 1902 Constitutional Convention, was Speaker of the Connecticut House of Representatives and the Connecticut Attorney General. After leaving the probate court in 1910, he became a superior court judge until 1915. In 1914, Holcomb was elected as Governor of Connecticut server three consecutive terms after being reelected in 1916 an 1918. During his term he helped Connecticut prepare for World War I with the establishment of a food supply council and a state council of defense. He established teacher retirement benefits and old age annutities, as well as a health insurance program. He also was involved in a bill that reduced the maximum amount of time a woman could work. He became the center of a poltiical storm when he refused to convene the Connecticut Legislature to act on the ratification of Woman's Suffarage Amendment of the United States Consituation. This was because he was personally opposed to the amendment. He left office on January 5th, 1921. Holcomb passed away on March 5th, 1932. Holcomb was raised in North Star Lodge No. 58, Hartford, Connecticut. He served as Worshipful Master in North Star Lodge. He later affiliated with Friendship Lodge No. 33 in Southington, Connecticut. Holcomb left his home to the lodge in Southington and it became Friendship Lodge's lodge hall. He was also a member of the Ancient Accepted Scottish Rite in Hartford.